A PONTELAND High School sixth former who has dug in to help his community has received a special council accolade. 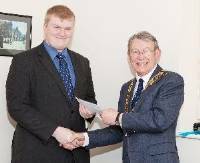 David Metcalfe was given the Second Mile Award, which includes a cheque for £100, by Ponteland Mayor Robin Ramsay at a recent Town Council meeting. He has been very active in the school as a library prefect and one of the founder members of the school choir among other roles and he is also a candidate to be school student president later this year. The Year 12 student has also recently helped the authority with some planting ideas for its Northumbria in Bloom bid and he and some fellow students had assisted with the re-planting of the rockery on Main Street and work in Ponteland Park. Ponteland High School's Head of Year 12 Dave Hicklenton said: "David has done quite a few community activities and he's always prepared to volunteer for things at school, so we felt it was right to nominate him for the award. "He has always been one of the students you can rely on and he always wants to help people — it's just in his nature." David said he would like to study pharmacy or ancient history at university and he would use the funds to help him in his studies. "I'm delighted to accept the award and it will be useful for me as I look forward to enjoying new experiences," he added.